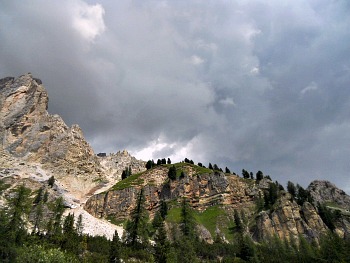 The Tofane: Majestic Dolomite Backdrop to the West of Cortina. The Tofane are the most majestic mountains among all those that overlook the ‘Conca ampezzana’ – almost of 'regal' appearance (see image above). From a geographical point of view, the Tofane are a mountain group that belongs to the Eastern Dolomites and part of the Dolomiti di Ampezzo (Ampezzo Dolomites'), immediately to the west of Cortina d'Ampezzo and to the NW of San Vito di Cadore. Their highest elevation reaches the respectable altitude of 3,244 m.
This mountain group is extended on the western side of the Ampezzo basin (‘Conca ampezzana’), between Passo Falzarego (2,109 m) and the Val di Fanes with a N → S direction, and counts among its main ridge several peaks above 3,000 m.
The most important of these are the three summits of Tofana di Rozes (or Roces), 3,225 m, the southernmost; Tofana di Mezzo (or Seconda), 3,244 m – the central and highest – and Tofana di Dentro (a.k.a. de Inze or Terza), 3,238 m, the northernmost, linked to the former by a thin crest. The ‘Second’ and ‘Third’ Tofane used to once host small glaciers, part of the Piave basin – now long gone because of the general warming up of Alpine climate and the average minor entity of prolonged snow on the ground during the winter months. Totally belonging to the province of Belluno, the Tofane are surrounded by three main valleys: the Val di Fanes to the N, the ‘Conca ampezzana’ to the E and the Val Travenanzes to the W, while the southernmost limit is represented by the Passo Falzarego (2,109 m), which puts in communication Cortina with Livinallongo through the ‘Great Dolomite Road’. The main access to the group from the south is via the ‘Great Dolomite Road’ itself (passing precisely through the Falzarego pass) and the ‘Alemagna’ National Road from the north, which crosses the Val di Fanes, while linking Cortina to Dobbiaco. Built during the second half of the 20th century and divided into three stretches, the “Funivia Freccia nel Cielo” (or more simply called “Funivia Tofana”) is undoubtedly the most direct way to reach the very top of Tofana di Mezzo. The station at the base is in fact just outside the centre of Cortina (1,250 m), right in front of the famous Stadio Olimpico del Ghiaccio (the Olympionic Ice Rink built for the Winter Games of 1956). The first station is at Col Drusciè, 1,778 m – a locality known above all for the two ski-slopes that descend all the way down to Cortina. From the second station – called Ra Valles (2,472 m – literally from the Ladin, ‘the valley’) – one can in fact enjoy a vast view over the Ampezzo basin and the surrounding mountains; here converge numerous ski routes, also linked to the Tofana di Rozes via the Forcella Rossa. The third and last station – known as Cima Tofana – is situated near the summit of the highest peak of the group, at 3,191 m. For safety reasons, this latter stretch (and the corresponding station) is closed during the winter season. 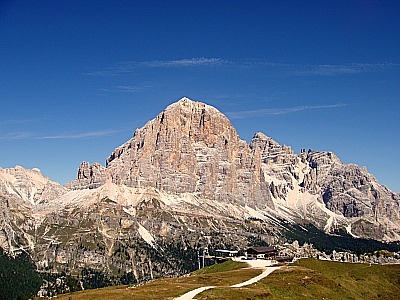 Following the boom of Cortina as a major resort (especially after the Winter Olympics of 1956), the Tofane – previously a relatively unfrequented group – have been launched into the ‘Gotha’ of the Dolomites, as well as becoming one of the best-known mountains within the whole Italian Alps. The pioneering activity of 19th century mountaineers, however, cannot be overlooked, and it was precisely in support of these early expeditions that the first huts were erected in the area, together with an extensive network of well-marked paths, ‘vie ferrate’ and – at a later stage – ski slopes too. 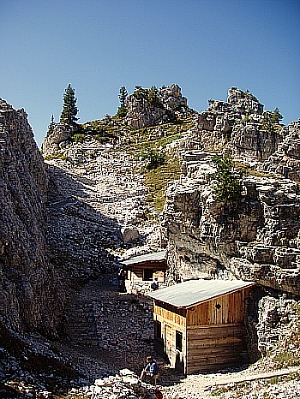 In the Tofane there are four main Alpine huts, some of them open both summer and winter (because of the high number of tourists present in the area). Rifugio Angelo Dibona (2,083 m), situated in the Vallon di Tofana and reachable even by car from the ‘‘Great Dolomite Road’’ or on foot from Pocòl. It is the starting point for many trails in the area and for the ‘vie ferrate’ of the Tofana di Rozes, as well as for the astounding ‘Sentiero Geologico Astaldi’ (described below). This facility is open summer only. Rifugio Giussani (2,580 m) is located at the Forcella Fontananegra and reachable from Rif. Dibona through a scree; it is the starting and departure point for the ascent to the Tofana di Rozes through the ‘via normale’ (for experienced mountaineers only). Rifugio Duca d'Aosta (2,098 m) is open summer and winter. It can be accessed from the ‘‘Great Dolomite Road’’ or by chairlift with the Piè Tofana ski-tow; also on foot with the path from Piè Tofana, or the un-tarred road from Pocòl. Rifugio Pomedes (2,303 m) is located by the Punta Anna. It is open summer and winter and can be reached on foot from Rif. Duca d'Aosta. 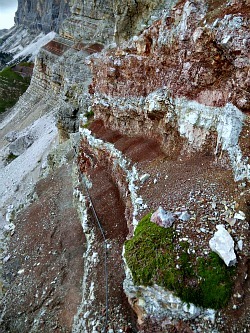 It is the base (starting point) for the ‘via ferrata Giuseppe Olivieri’ and the other end of the traverse of Sentiero Astaldi (read below). Rifugio Col Drusciè (1.778 m) is functional to the ski slopes in winter and so it is in many ways more similar to a busy restaurant than a proper Alpine hut – as it generally tends to happen with the more easily reached locations. It goes perhaps without saying that in the Tofane there is a wide choice of paths and trails suitable for all abilities. Among these, one can include the itinerary of Col Rosà – a roundtrip with the possibility of visiting the waterfalls and the Fanes canyon; it is a trail of medium difficulty and with a difference in altitude of about 400 m. The famous Sentiero Astaldi, described in more detail below, is a ‘via ferrata’ of easy-medium difficulty, with a difference in height of only about 200 m (the iron rope fixed as an aid alongside the narrow but astonishing ‘Sentiero Geologico Astaldi’ can be just about made out in the picture below). The traverse from Rif. Dibona to Rif. Giussani and the val Travenanzes descends along the western side of the massif; it is classified of medium difficulty but is made more demanding by its length; nonetheless, it crosses one of the most interesting areas of the Tofane. The Piè Tofana – Cianderou trail runs along the woods on the eastern side of the massif; it is an easy path connected also to Lake Ghedina, at the wooded foot of the Tofane (a very easily reachable location, even by car). Lastly, the path Grotta di Tofana to Castelletto is an itinerary of great interest and historical relevance that starts at Rif. Dibona by the Tofana di Rozes and presents a good occasion for visiting the so-called “Gallery of Castelletto”, which was theatre to one of the best known episodes of WW1 in the region of Cortina (below is another image of the almost surreal colors of the rock formations met alongside the ‘Sentiero Geologico Astaldi’, undoubtedly one of the highlights of a visit to the Tofane). The first ascents to have taken place in absolute in the Tofane group were carried out by the Austrian Paul Grohmann and Francesco Lacedelli from Cortina, who conquered the summit of Tofana di Mezzo in 1863. The summit of Tofana di Rozes was conquered precisely one year after that, in 1864, by the same two mountaineers and also by the two climbing mates Santo Siorpaes and Angelo Dimai, both from Ampezzo. Lastly, the summit of Tofana de Inze was conquered in 1865 by the same Paul Grohmann, accompanied this time by Angelo Dimai. As most of the mountains in the area, the Tofane were also the theatre of bitter fights between the Italian and Austro-Hungarian troops during WW1. War action in the Tofane was long (1915-17) and debilitating – especially in the last stages, when the war activities ground to a halt and the troops found themselves stranded for months on end in the harsh winter of the highest reaches. The location of Castelletto (see above) has become emblematic in that respect. This is a spectacular paleontological site where to discover karstic caves and amber – a real fascinating 'bank of time'. This small circular roundtrip cannot exhaust the extreme variety of landscapes and geologic situations that the Ampezzo Dolomites can offer, but it represents nonetheless one of the most typical and spectacular landscapes of the Dolomites, allowing at the same time to visit one of its foremost paleontological sites, which have rewarded us with discoveries of an exceptional scientific vaue – such as the most ancient ambers in Europe. The geologic formations of the Ampezzo Dolomites – all derived from marine sediments deposited in the Thetys sea and subsequently lifted and petrified – have an age comprised between the Medium Triassic (230 m.y.a.) and the Cretaceous (130 m.y.a.). 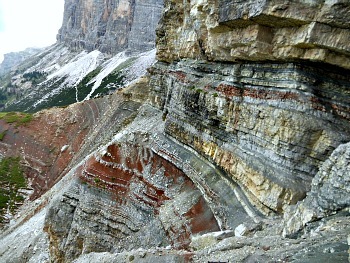 At the foot of the great Main Dolomite walls of the Tofane – above Rifugio Angelo Dibona (in the location portrayed above) – one will meet thin layers of clayey material, brightly coloured in a deep Burgundy red and alternated with the brown rock layers of the Raibl Formation (220 m.y.a. ), which testify to the lagoon environment where these sediments were first deposited. During this phase – characterized by a climate which was almost sub-tropical – the land was formed by an alternation of shallow, salty waters and emerged islands, on which ancient forms of resinous plants known as ‘Voltzie’ used to grow. From the trunks of these plants resin drops were exuded, which encompassed small insects or pollen granules that are perfectly conserved to this day. These tiny resin drops – subsequently fossilized as amber – then fell into the water, and remained imprisoned in the marine sediments ever since, reaching us with their important content of biological history. Higher up in the ‘Vallone di Tofana’, following the trail to Rifugio Giussani and then branching off to the right for the ‘Sentiero attrezzato Astaldi’, one reaches a hillock from which a wide view opens up on the spectacular red-brown Layers of Raibl (‘Strati di Raibl’). 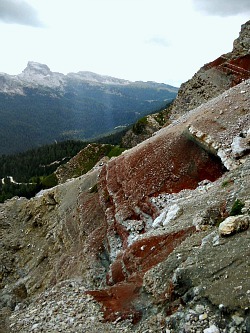 Subsequently, taking to the left at the base of the wall of Tofana di Ròzes, one reaches the path that leads to the ‘Grotta della Tofana’, from which one can make one’s way back to Rifugio Dibona via a shorter and more direct route (in the picture below, observe the astounding deep-crimson colours of the ‘Strati di Raibl’, surfacing along the ‘Sentiero Geologico Astaldi’). Another word of warning: although, in my opinion, this trail is an absolute highlight within the context of the Dolomites – and a rope fixed to the rock wall makes the experience quite safe – let me make this clear once and for all: despite not being, strictly speaking, a 'via ferrata' – and therefore technical equipment not being compulsory – still great care should be taken when walking along the 'Astaldi Geological Trail', in both directions; also, it is not advised to people with little hiking experience or who are afraid of heights. The ‘Grotta della Tofana’ is reachable with a stretch of path which is short but also quite exposed; the cave is of circular shape and is about 300 m deep. It is a rare example of karstic phenomenon in the Main Dolomite – less important than similar caves that can be seen on the limestone plateaus of Fosses and Fanes, but equally spectacular for the ice formations that are visible in spring. In analogy with the famous findings of the remains of the ‘Orso delle Caverne’ (the “Bear of the Caves”) in nearby ‘Grotta delle Conturìnes’ (in Val Badia/Gadertal), at the entrance of the Grotta della Tofana some vertebrae of a carnivorous feline have also been found, dated about 20,000 y.a. These huge carnivores populated the area in more recent times, when the Dolomites had already emerged from the sea and become the high mountains we see today – and animals had started establishing their dens in caves similar to this one. The disappearance of such animal forms of life coincided with the end of a warm period and the arrive of the glaciations (12,000 years ago), which covered in ice all the Alpine valleys for more than 3,000 years. The Lagazuoi (2,835 m; Lagazuoi-Berg in German) is a mountain belonging to the Fanis Group; from a strictly geographical standpoint, it is part of the eastern Dolomites of the Val Badia/Gadertal, even though it is more often associated with the Ampezzo Dolomites because of its proximity to Cortina, and also for its being inextricably linked with it from an historical point of view (especially the war events). 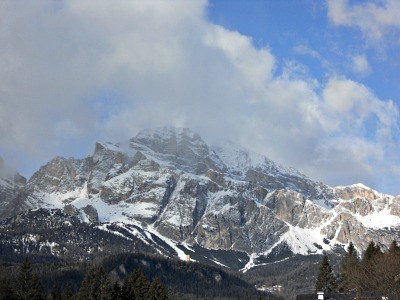 Despite the very close proximity of the border with South Tyrol, from an administrative point of view the mountain belongs entirely to the Veneto region, and it is divided between the territories of Cortina d'Ampezzo to the east and Livinallongo del Col di Lana to the west (in the image above, the Lagazuoi as it is seen from the other side of the Falzarego Pass, by the Rifugio Cinque Torri). The Lagazuoi is formed in reality of two clearly distinct main reliefs, respectively called Piccolo Lagazuoi (Kleinen Lagazuoi, 2,778 m) and Grande Lagazuoi (Großen Lagazuoi, 2,835 m), standing behind it. The massif is delimited to the south by the Passo Falzarego (2,105 m), to the west by the Passo Valparola (2,192 m), to the north by the Alpe di Fanis and the Val Travenanzes and finally, to the east, are the complex of Cima Falzarego-Col dei Bos and the Tofane massif, which separates the range from the underlying Ampezzo Valley. 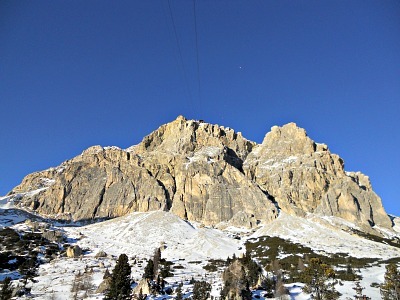 In fact, as a note of peculiarity, the Lagazuoi is the only mountain considered part of the Ampezzo Dolomites not to be visible from the 'conca' itself, being concealed by the imposing bulk of the Tofana di Rozes (to be more precise, however, the Lagazuoi can be seen from the basin’s southernmost fringes – namely from the hamlets of Zuèl and Acquabona, also belonging to Cortina. In the vicinity of the massif one can find the small Lagaciò, or Lago di Lagazuoi, – a perennial lake fed by subterranean waters. Situated under the Forcella del Lago – to which it gives its name – and along the valley that leads to Armentarola, the Lagaciò is reachable by walking the ridge of the Lagazuoi from the cable car station along the summit, following old military tracks (see below a picture of the mountain taken from the underlying cable car station). During the course of WW1, between 1915 and 1917, the Lagazuoi was theatre of harsh fights between the Italian and Austro-Hungarian troops, both of which dug a complex network of tunnel and galleries into the rock of the Piccolo Lagazuoi, and attempted at the respective positions through the explosion of mines. In October 1915 the Italian Alpine regiment occupied some positions on the southern flank of the Piccolo Lagazuoi, amongst which was a narrow ledge then become famously known as Cengia Martini, which crosses the rock wall from west to east and was strategically important, while the Austro-Hungarian positions were located at the summit of the mountain itself. In order to chase the adversaries from their position – fortified and dug into the rock – the Austrians exploded three mines, the most potent of which in 1917 blew part of a rock wall almost 200 metres high; in spite of that, the Italian positions on the Martini ledge were not abandoned. In turn, the Italians dug a new gallery covering 200 metres in height inside the belly of the mountain, up to the ‘anticima’ of the Piccolo Lagazuoi; the crater generated by this huge explosion is still recognizable. After the defeat at Caporetto later in 1917, the Italians withdrew from their positions, and all military operations in the area drew to a close, after consuming months spent in the high snow. The massif is endowed with an important cable car (see image above) that connects the Passo Falzarego with the Rifugio Lagazuoi (2,752 m), on the Piccolo Lagazuoi. From there, numerous paths and mule-tracks depart in various directions and most of them are carefully signposted by the CAI (Italian Alpine Club); many take westward towards the Val Badia/Gadertal, northwards to the Val Travenanzes and the Val di Fanes and eastwards towards the Col dei Bos and the Tofane group (Tofana di Ròzes). Recently restored, the galleries and the Italian and Austrian trenches of WW1 are now open to the public and can be visited freely as part of the Open-air War Museum ('Museo all'Aperto della Grande Guerra'; see an image below), which offers a notable attraction of undoubted high historical and naturalistic value.